I don’t think she can enlist Wall Street oligarchs and recruit an army of dewy-eyed volunteers. Above all, I don’t think she can spout populist rhetoric without any policy specifics to back it up. Clinton insiders also ingratiate themselves to reporters by dishing about her need to seem more authentic. Someone should tell them it’s hard to seem real when you won’t tell people what you really think. A bigger problem for Clinton may be that we know what she thinks. Her platform is like Obama’s trade deal; she won’t say what’s in it, but we can easily guess. It isn’t populism and it isn’t reform. The TPP? She never met a trade deal she didn’t like. The minimum wage? She and Obama let McDonald’s get the drop on them. The surveillance state? Her handling of her emails told us all we need to know of her views on transparency. More war in Iraq? For 12 years as a senator and secretary of state she was John McCain’s best friend. If she gets to be commander in chief, get ready to rumble. She’s weakest on the sleeper issue of 2016: public corruption and the general debasement of politics and government. Voter disgust is so deep even consultants who make their real livings off corporate clients tell their political clients to talk about it. In her speech Clinton vowed to “wage and win four fights for you.” The first three were jobs, families and national security. The fourth was “reforming our government and revitalizing our democracy.” She vowed to overturn Citizens United and fight GOP efforts to disenfranchise the young, the poor and people of color, but then drifted off onto technology and cutting waste. Unlike nearly every Republican announcing for president, she never mentioned ethics or corruption. Democratic elites don’t want to hear it but Hillary Clinton’s in trouble. It isn’t in all the data yet though you can find it if you look. In a straw poll taken in early June at a Wisconsin Democratic convention she edged out Bernie Sanders by just 8 points, 49% to 41%. In a poll of N.H. primary voters this week she beat Sanders by 41% to 31%. An Ohio poll had her in a dead heat with the likes of Ted Cruz and Rand Paul. If Sanders can poll 40% in a Wisconsin straw poll in June he can do it an Iowa caucus in January. Imagine a Hillary Clinton who just lost Iowa and New Hampshire to Bernie Sanders. It’s still hard to picture but it gets easier every day. You don’t win your next race running someone else’s last one. Trying to do so, Clinton repeats her big mistake of 2008: not sensing the times. There are smaller changes she can make right now: hire better speech writers, including at least one with a sense of humor; put her family foundation under independent management; tell her husband to stop giving speeches or else start talking for free. But her whole campaign model is wrong. ‘Clinton Democrats’ hate to admit there are issues you can’t finesse or that they must ever choose between the middle class and the donor class. Clinton better figure it out now. When the data’s all in it will be too late. Clinton resists change. Meanwhile, Bernie Sanders is the only candidate in either party who seems to feel the tectonic plates of our politics shifting, perhaps because he’s expected the change for so long. 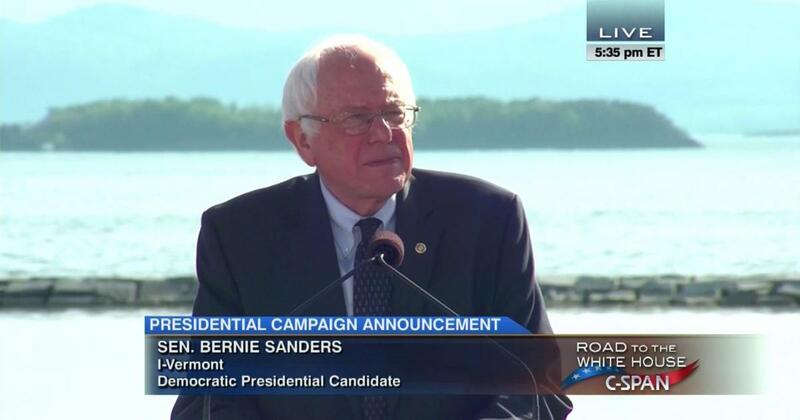 His is still an improbable candidacy, but less improbable than it was a month or even a week ago. If he clears out the second tier, his battle with Hillary could become epic, forcing not just her but the Democratic Party to choose between the middle class and the donor class; between corporate and democratic rule; the battle over trade carried over into a presidential election. While Clinton is weak on both economics and government transparency, she has additional weaknesses when facing Democratic voters. This includes how she helped George Bush lie the country into the Iraq war with false claims that Saddam had connections to al Qaeda, her continued push for increased military intervention as Secretary of State, and her conservative positions on civil liberties, the environment, and social issues. I hope Curry is right that Clinton can be beaten in Iowa and New Hampshire despite her tremendous lead in the polls.